The Golf Practice Cage is a free standing, durable, multi-sport practice cage. Great for indoor or outdoor use. Durable shock corded frame and backstop safety feature. Easy to setup. Folds quickly and easily for storage. Dimensions: 11'10"W x 7'H x 5'D. If you have any questions regarding the Golf Practice Cage, please give us a call, we would be happy to help you with any questions you may have. 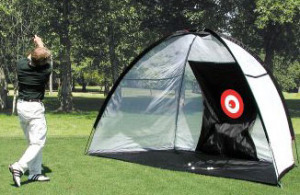 Write an online review on the Golf Practice Cage, and share your thoughts with others.